here, it clearer why the symbol for 5 represents 5 things. and it can be extended to larger bases just by adding more and larger circles with dots. That's cumbersome and not at all practical. Does anyone have trouble with math that stems from a difficulty understanding that the symbol '5' represents this many (|||||) things? See also: https://en.wikipedia.org/wiki/Roman_numerals#Hypotheses_about_the_origin_of_Roman_numerals, as an i interesting conjecture. Either to acknowledge of actively build in to your place-specialised large number versions. Then there's the von Neumann ordinals that can be modified to your personal taste in pictographic representations). Not knowing what you're actually aiming to do, I'm unsure whether to say "it's been done" or "it was done, then done better still"
gmalivuk wrote: That's cumbersome and not at all practical. Does anyone have trouble with math that stems from a difficulty understanding that the symbol '5' represents this many (|||||) things? More than that, I might have to squint to make sure that's not (||||||). Which is why the add-and-subtract nature of Roman numerals towards the nearest defined 5-or-0 place is handy. Glanced-at-||| is still mostly discernable from a ||, etc. I might have to squint to make sure that's not (||||||). Which is why the add-and-subtract nature of Roman numerals towards the nearest defined 5-or-0 place is handy. Glanced-at-||| is still mostly discernable from a ||, etc. Though in fairness the version phillip suggested was better arranged, similar to how it's fairly easy to tell at a glance how many symbols are on a die or playing card or domino. gmalivuk wrote: Though in fairness the version phillip suggested was better arranged, similar to how it's fairly easy to tell at a glance how many symbols are on a die or playing card or domino. I agree, to some extent. But as an obvious example of 'handwriten' symbols (mouse-clicks-in-Paint?) that example sheet shows that 'messiness' can rearrange the dots around a bit to (nearly) touch each other and the boundary and subtly shift the presumed deliberate pattern. Dice/domino-dot patterns for 0 to 9 are commonly used¹ that are also perfectly recognisable in any rotational(/reflective) position (unlike having to underline 6 and 9 in numeral-based labels, even on trionimos where "the enemy base edge is down" also applies²) and might even be improvements on this version of the idea. Though I imagine anyway that unless this is a sort of cuniform writing system (impressions easily made for dots, the harder part being the containing stroke unless you have a 'cookie-cutter pen' specially for impressing that) handwriting the dots will turn into a cursive zig-zag of not-quite-lifted-pen-marks that eventually would resolve into a standardised squiggle for each pattern that bears a mere shadow of its original poly-dotted purpose whilst uniquely resembling a 'digit' that whatever futurekind persons there are may describe similarly to the OP complaint about the '5'. ¹ Typically being: None, single central, two opposing corners, …and central, all four corners, …and central, two parallel corner-edge-corner rows, …and central, all corners and mid-edges, …and the middle one to complete the grid. ² I'd also mention the conventions used in British OS map contour-height labelling, especially as they converted from imperial feet heights to metric metre ones, but that's a whole interesting/boring[delete as inapplicable] thread of its own! Oof, yeah, those are terrible, sorry. Humans can't count-on-sight piles greater than 5 or 6, in general. 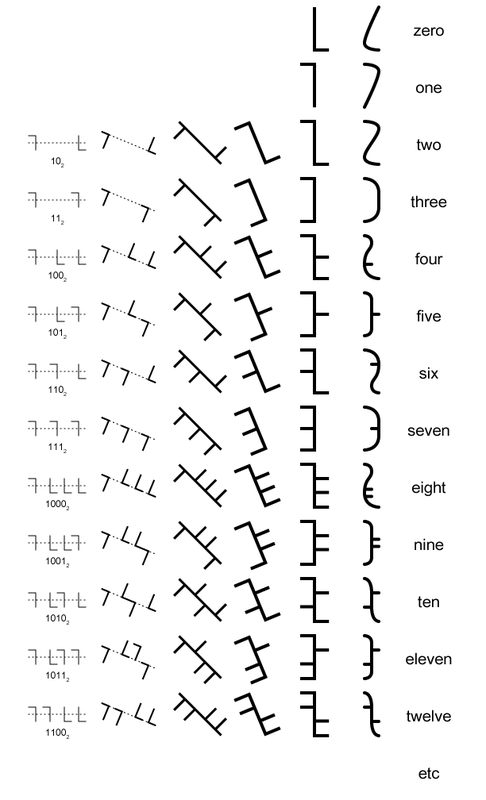 This means the digits for 7-9 are very difficult to tell apart from each other. This is why roman numerals have a special form for 5/50/500, rather than just using IIIIIII (which I'm certain you can't tell on quick glance is 7, while VII *is* trivially readable).